Why should you play video poker instead of its regular version? I Want to Beat Video Poker! But Where? Want to know how to beat video poker? Check out this article for the best tips and strategies! We all have that one friend who lives off poker. But what if I told you that you don’t need to quit your day job and devote years of studies to become successful at beating video poker machines? It’s simple, really - video poker is what you need. And this article will help you become better at video poker, no matter which variation you choose. You see, video poker is the perfect game if you know what you’re doing. And the more you know, the more you win. 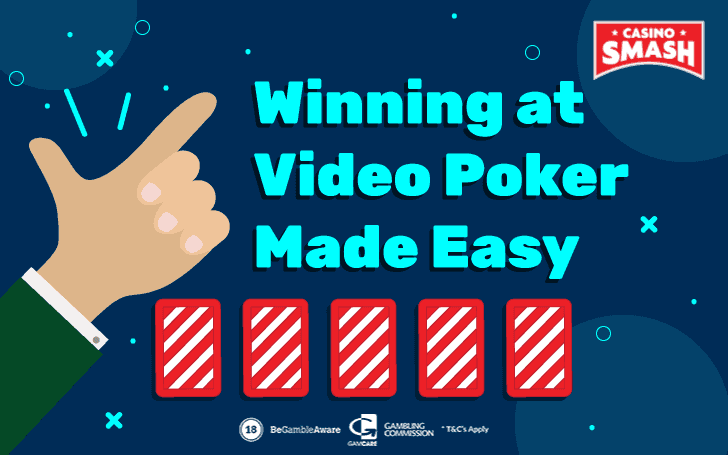 However, if you’re already familiar with most of the strategies and ways to beat video poker, you can skip this article and go straight to an online casino where you can play it all you want. For this, I suggest you try PlayAmo Casino. You’ll love the video poker selection here, whether you prefer Jacks or Better or any other type of this game. Make your first deposit and get a 100 percent cash match of up to €100 + 100 free spins to play slots as well. However, if you feel that you need more tips on how to beat video poker machines, read on! When you crave for some casino games, video poker is one of the best options you could take. Forget slots, roulette, or any other game where your skills don’t matter. Sure, these games are great when you want to spend the night having some fun, but you can’t influence the outcome here. If you want to actually have some control over your winnings, always go for video poker. I’m not surprised that it is the first choice of the majority of professional gamblers. Video poker comes with high odds of winning, a.k.a low house edge. Of course, the casino you play at will surely have some advantage over you (they have to make a profit, after all), but you are not likely to lose too much money over time. With slots, for example, you may find yourself broke after a few hours of spinning if you’re not lucky enough. But when it comes to video poker, even an unsuccessful evening won’t hurt as much. That’s why so many people play it. When you go to any regular casino, you’ll see rows and rows of video poker machines. When you visit a gambling site online, you’ll find lots of different video poker games. There’s a huge demand for it - and the reason is obvious. With a little knowledge and practice, you’ll find yourself fully immersed in the game, forgetting all your worries. And with the right strategy, hands down, you can easily win at video poker machines. There are two major kinds of poker - the regular one, played live with other players, and video poker, where you play against a machine. Interestingly, video poker can be a much better choice from the two. Did you know that playing against a machine will give you an advantage over playing against other people? Not only the house edge is low, but you also can choose the game with the best odds! Does that mean that playing video poker will give you a bigger profit? Tired of making the same old poker face? When playing online against a machine, you won’t need to pretend anymore. In other words, it’s far less stressful. And when it’s less stressful, you can think much more clearly - and this is a huge help when you want to win at video poker. This is probably the best aspect of video poker. As you are not playing with real people, there’s no one to rush you. Count the cards and decide your next action at your own pace. You can even write down what you need on a piece of paper - nobody will judge you! Not all video poker games are the same. There are a lot of versions of this game and you must read the rules before you jump into any of them. However, some things stay the same. Most of the video poker versions you’ll encounter will have the same premise. 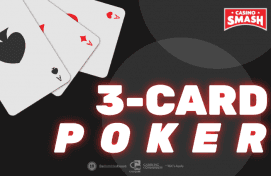 You’ll play a five-card draw game with a 52-card deck. Now, the actual game begins. You need to select, which cards you want to hold for the next round, and which ones you want to discard. Simply click on the cards that you want to keep. They will have “Hold” written on them. After choosing to “hold” some of the cards, click “Draw” again. Now, the game will choose other random cards instead of the discarded ones. The five-card sequence you get is what truly matters. If you have any of the combinations present on the game’s table, you win. If there are none, you lose. As simple as that. The amount of your winning depends on what kind of combination you get. The smaller chance to get a certain combination, the bigger more money you win. For example, it is quite likely to get Jacks or Better, so it pays far less than Royal Flush. Each video poker game will have a different table with different hand values. Be sure to check it out before playing. Also - good video poker machines offer the possibility to hit the jackpot. I love this feature - it makes playing much more exciting! However, the most important thing in winning at video poker is to choose which cards to keep and which to discard. And that’s what we’ll talk about in the next section. Even though other casino games don’t give you any choice but to trust your gut, video poker is different. To become a successful video poker player, you need a strategy. Especially if you want to start with almost no money at all - let’s say, $20 - and end up with hundreds or even thousands of dollars. That is, if you are lucky - of course. Tip: before applying any video poker strategies in real life, play the game for free, for example, at PlayAmo Casino. It’s a smart choice to get better before you use real money. There are so many types of video poker! Of course, there are a lot more. It’s important to read the rules before playing each of the games, as they can be more different than you’ve expected. Below, I’ll describe the basic strategy of an immensely popular video poker game - Jacks or Better. Did you think that all Jacks or Better video poker games have the same outcome? Before anything else, you must know that some online casinos want to make as much profit as possible, thus making the house edge bigger than it should be. Don’t be too lazy and make a research before you play. Luckily, you don’t have to look any further than the pay table of the game. There you will find the return rate involving each winning hand. You’ll be surprised to see how the house edge differs. Some casinos might raise it to as high as 3 percent, which means that this video poker machine has a 97 percent return rate. Avoid such places at all costs! On the other hand, a video poker game can have a house edge of 0.5 percent, which would mean a 99.5 percent return rate. So, why should you settle down with the first video poker machine you come across on the Internet? A few minutes of research can greatly affect your winning outcome. This might mean hundreds of dollars - and there’s no reason not to invest in better luck! The amount of money that you bet on a hand is important. It’s evident that a beginner should not bet as much as a professional - and vice versa. If you’re just at the start of the quest to beat video poker, start small. Get used to your strategy, the rules, and the game itself. You don’t want to lose too much when you’re still not sure how to play. Increase your bet only when you feel confident enough. On the other hand, once you know your game 100 percent, give it all out. It might sound crazy, but there’s a good reason for this. There’s this one thing called Royal Flush - the jackpot of video poker. When you hit it with maximum coins, you’ll get the Royal Flush bonus, which is only given for those who bet the biggest amount of coins possible. This maximum bet video poker strategy applies when you want to get the best out of the game. If you’re not after the bonus, you don’t need to risk it all. I know that it’s fun to play casino games as quickly as possible. You bet, you spin, you win - all this excitement makes you feel like you’re on a highway to victory. Here’s what you need to do if you want to know how to beat video poker - slow down and think. After all, the biggest advantage of video poker is the fact that you don’t need to make a decision as quickly as possible. So why should you let it go to waste? Because of the house edge, you are likely to lose more money the longer you play. As a result, the casinos want you to play as quickly as possible. But you are not a thoughtless gambling machine. And that’s what gives you the greatest advantage of all. Finding the perfect casino is crucial if you want to win at video poker machines as much as possible. But that’s not enough - you also have to stick to it. Not only because the house edge is low. Most casinos have great VIP programs that help players maximize their winnings the more they play. One thing would be bonuses to play video poker. Even though they are rare, video poker offers can help you win more by doubling or tripling your deposit. You might even get free plays as a reward for being loyal. As the time goes by, playing at a single casino will save you lots of cash. Which is the reason you’re playing in the first place! You might already have your favourite online casino. However, this doesn’t mean that it’s the best place to play video poker at. If you’re up for something new and exciting, check out PlayAmo Casino. In terms of video poker, it is wonderful. Here you’ll find countless variations of this game - with a player-oriented house edge. And right now, our readers have a huge advantage. Register through this website and double your first deposit! While grabbing 100 free spins on the go. With such big bonuses, all you need is mere $20. Play and see how your bankroll grows hour by hour. For me, that’s the best feeling on earth. In case you get tired of video poker, explore the huge list of PlayAmo’s slots, blackjack, roulette, baccarat, and live dealer games. New Slots Alert: Keep Calm...And Spin the Ink!